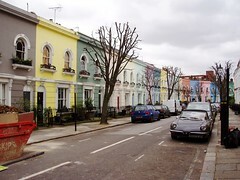 An area in the London Borough of Camden, within postcode district NW5. The development of the area was as a settlement on the road to Highgate, which became more favoured in the mid-18th century with the coming of improved coach transport. It remained partly rural until the mid-19th century, but all this had gone by the 1870s. Kentish Town Station (and South Kentish Town Station, now closed and at present the site of a Cash Converter store) opened in 1907. The area saw improvements to its run-down conditions in the early-20th century, and there was redevelopment after World War II, which saw the return of the middle-classes. The area's main thoroughfare is Kentish Town Road, whose mix of gastropubs and discount stores perhaps gives a flavour of the different local populations. It also houses the [Forum]? music venue. Kentish Town borders Belsize Park to the west, Gospel Oak to the north, Tufnell Park to the north-east, Camden Town to the south and Chalk Farm to the south-west. Last edited 2010-11-12 14:33:02 (version 5; diff). List all versions. Page last edited 2010-11-12 14:33:02 (version 5).